Known for its fair which was held five times a year under the Russian Empire, the small village of Velyki Sorochintsi - located in Central Ukraine, south east of Kiev - was made famous by Nikolai Gogol's opening story, Sorochintsi Fair, in his folk-tale collection Evenings on a Farm near Dinkanka. In 1874 the great innovator of Russian music, Modest Mussorgsky, set to work on fashioning a comic opera from this material. Composition proved rather haphazard, however, and by the time of Mussorgsky's death only about half of the work was drafted or complete in piano-vocal score form. What we have here is leading Soviet composer Vissarion Shebalin's finished version, generally considered to be the best of the bunch. In creating original music based on Mussorgsky's sketches and even portions for which there was no drafting at all, Shebalin was able to adopt the figurative style of Mussorgsky's speech so that the score appears absolutely seamless, without any clash of idioms. The work abounds in folk melodies that its original author attempted to fit with the speech patterns of the Ukrainian language as part of his quest for the 'truthfulness in art'. Two portions of the opera have pursued an independent existence in concert halls: the Act 1 introduction and the dynamic Hopak. Also featured is the choral version of what we've come to know as St John's Night on the Bald Mountain, an intermezzo that represents Cherevik's fevered dream of a Black Sabbath celebrated by the Devil and the sinister demon Chernobog. Recorded in 1996, this release features an all-Russian cast deftly backed by the Ekaterinburg State Academic Opera Orchestra. The performances are all more than up to scratch, and Evgeny Brazhnik - one of Russia's most acclaimed opera conductors - guides the music with ease and panache. 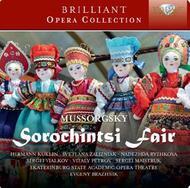 A must-have for the Mussorgsky-phile.